Welcome to the FBC ... Sorry to hear that Dezzie is having a rough time at the mo. I can't offer any real advice but I hope someone on here can help you. Hello and welcome to the FBC! I've always been told that the "teenage" period is when Beardies build up their fears, and it looks like that's what your Dezzie has been doing, doesn't it? I was thinking that maybe, because you have a solid wall between him and the sound of cars noisily whizzing by, he can hear but not see what's making that awful racket, hence his fear of going out of the garden (getting closer to the cause of his fear) - does that make any sense to you?... I remember reading some really good advice about this sort of thing here, probably from Chris (Snowleopard here). I hope he sees your post and can give you a satisfying answer. In the meantime, try looking for a similar problem in the "Health" forum, that's probably where Chris's initial reply is! Hi and welcome to the FBC nice to have you here . Sorry to hear you are having problems with Dezzie though, odd that it started suddenly like that. Maybe something happened that you were not aware of that frightened him and he has associated the traffic noise with that event? As has been said Chris (Snowleopard) is are knowledgable person on behaviour issues so hopefully he will be along soon, meanwhile I wouldn't force the issue, try not to make too much of it, frustrating as it must be, as that will just exacerbate the fear. Sounds like you are managing the situation but probably not a regime you want long term, the herbs sound a good idea and would probably take a while to kick in so don't give up on that yet. Flower remedies can be useful so may be worth looking them up, Bach is the most common but there are things like Australian Bush remedies as well. I would have said maybe thyroid but he really is too young for that I think. Hope you get some help and do keep us up to date with events. There are peeps on this site that can give some good advice. I am not one of them though. Do stay with us and let us know how it goes. Welcome to the forum and sorry to hear about Dezzie. Some dogs can become increasingly insecure and anxious in certain situations due to the lack of the hormone testosterone after neutering. However some of these dogs show some anxiety prior to the procedure. A good vet will assess a dog beforehand on its personality and emotional state to decide whether neutering will benefit that particular dog. There are a number of medical conditions that dogs can suffer from which can cause behavioural changes so it’s best if you take Dezzie to your vets so they can rule any of these out before trying to modify his behaviour. This is because if you try to work on Dezzies emotional wellbeing and behaviour and a medical problem is present but undetected the behaviour modification may have little effect and may cause him further stress and anxiety as the initial cause has to be treated. 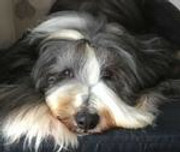 Like us humans dogs can suffer from emotional upsets and this is what is the problem with Dezzie, his behaviour is just the outlet for his emotions. These emotions can be suppressed and there may be no signs that your dog is concerned over a particular thing, or they can be so subtle you may not pick them up. As time goes by it becomes increasingly difficult for the dog to keep these emotions at bay and has to let them out often through their behaviour. People do the same and it’s not healthy for us or our dogs. It could be possible that the timing of Dezzies castration is coincidental with his change in behaviour. I think you could well be right that your garden wall and its location may have something to do with the way Dezzie feels at the moment. My other beardie Holly was a bit scared of the noise of lawnmowers. If she was in the back garden and heard one she would come inside. However when I was cutting the grass she would follow me around quite happily and on our walks if she saw someone else cutting their grass she was fine if she could see them, although with Dezzie now he reacts fearfully when he both sees and hears the traffic. Personally I think it likely that Dezzie has become fearful of the noise of the traffic prior to neutering but has not shown that to you before now. The castration has not likely helped him with this and may have amplified his response, as it’s now become too much for him to cope with. As to why this has affected Dezzie and it may not have other dogs is very complex. There can be very many reasons but in some cases we dont even know what causes people to be fearful of certain things so I dont think we do with dogs either all the time. Without me seeing you and Dezzie I am unable to give you any guidance in how to actually help Dezzie overcome this unfortunately as my advice is tailored to Dezzie depending on his personality, emotional state and behaviour and yours as well of course. Any advice given could be detrimental to Dezzies future emotional wellbeing. If you would like to pm me I could give you my number and we could talk about Dezzie in more detail. Once you have seen your vet with Dezzie you could ask them to refer you to their behaviour specialist or I would be happy to help find you someone in your area. Thanks for your help. Dezzie had a visit to the vets who examined him and took some blood for testing. That has come back all clear. So it looks as if it is emotional rather than medical.the CD that I ordered arrived and has no effect on Dezzie at all he doesn't even lift his head. Not sure where to go from here he has been on the herbal medication for 15 days now no better. I will keep him on it hopefully it will kick in soon. Thanks for the update, good news there's nothing medically wrong, such a difficult thing to deal with though. Maybe you need to consider some professional help, but that can be expensive; if Dezzie is insured some companies do cover that. If you do go that route be very carefull who you see as some can use dubious methods and often make things worse. C.O.A.P.E are very good if you have one near you. Hope you get him sorted. Thanks for letting us know how things went at your vets. It can depend what your vet actually tested for. If it was a routine blood test, although good they found nothing, other tests may need to be done to diagnose potential illnesses but your vet has likely felt this was not needed and at times you have to insist. The CD’s are more suited to playing to puppies to prevent them from developing a fear of noise rather than helping a dog overcome it, although they can be helpful. They are played at a low level so that your dog shows no reaction to it, as Dezzie is doing. You are then supposed to reward the calm behaviour with food and over time gradually increase the volume while rewarding the calm behaviour. You can also start playing a game with Dezzie and then put the CD on at a low level and then again gradually increase the volume over time if Dezzie shows no reaction to it. If a dog reacts to the sound then it's to loud to fast. Vet’s I have known have prescribed medication for some dogs who suffer from fear of a particular kind to help me help them overcome their worries. To be honest none of these have helped so it’s unlikely the herbal medication will unfortunately. Dezzie needs to be desensitised to the noise of the traffic, when he can see it on the roads and in your back garden. How this is done is very important as if done incorrectly or to fast then you can cause only more anxiety and stress for Dezzie. You are going to need a professional to help you but as Jacquie said these are expensive and you have to be careful who you employ. Did you ask your vet about their behaviour specialist? My offer from my first post still stands. Are you thinking of the adrenals, snowleopard? Some vets do not routinely include the testing of the electrolytes. Perhaps Mickrick could find out exactly was tested for. It may be that after the castration Dezzie’s hormones were (and may still be) disrupted and this has helped the fear to escalate. Beardies do tend to learn behaviours quickly and not always good ones! They know the routine and he will probably be anticipating and unfortunately stressing himself when he realizes where he is going. So it may help to break the cycle. Could you for a while not take him out, but just play with him in the garden? Then after some days (or weeks) try to take him out, just outside the gate and bring him back immediately and so on increasing the distance? Of course it does not address the problem if he does walk fine with other people but at least then you know what the problem is. No real update at the moment just wanted to thank Chris for the suggestions duri g our phone call the other night. Your welcome Micheal. It was good to talk to you about Dezzie. Call me any time if you want to chat about Dezzie I will help in anyway I can.